Having young kids I got interested in stop motion animation so I could make some short entertaining video's with their own toys, in particular their Lego Duplo sets. I got most equipment anyway and I only had to invest in some white paper and card board which is needed for the background. So 10 € later could set up a mini studio. Results can be seen on my Legobrick Parade YouTube channel. I did encounter some pitfalls which can really ruin the quality of the video. In this article I will show you what problems I encountered and how I solved them. When lighting the scene I wanted to have soft lighting which didn't produce hard shadows. Hard shadows give too much contrast and are usually not very nice to look at. As the key light I used a 1K tungsten spot with a soft box. This diffuses the light enough to get rid of harsh shadows. As a fill light I used a 650 Watt spot. I didn't have a second soft box to diffuse it so I have put a polystyrene panel above the scene and pointed the spot towards it. The light bounces back down and gives a soft filler which removes even more shadows. The white background paper also helps bouncing the light a bit to make it softer. Basic scene lighting for my stop motion project. Only the spotlights illuminate the scene. One of the difficulties of shooting stop motion is to keep consistency in the lighting to avoid differences between frames. Even small differences are a cause for a nasty flicker once you edit your clip together. It does seem simple enough but there are many different causes for flicker which you all need to address to get clean footage. 1. Shoot in an environment where you have full control over the light. This seems trivial but shooting on a sunny day with clouds will give you different light situations every couple of minutes. On video this is usually not that big of an issue since you continually shoot the footage at 25 frames per second or so. In stop motion there might be a pause of a couple of seconds or longer while you change the scene before you take the next frame. This is a guaranteed way to flicker. 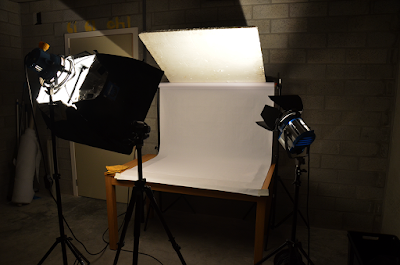 Shoot preferably in a room where no external light sources control the lighting conditions. 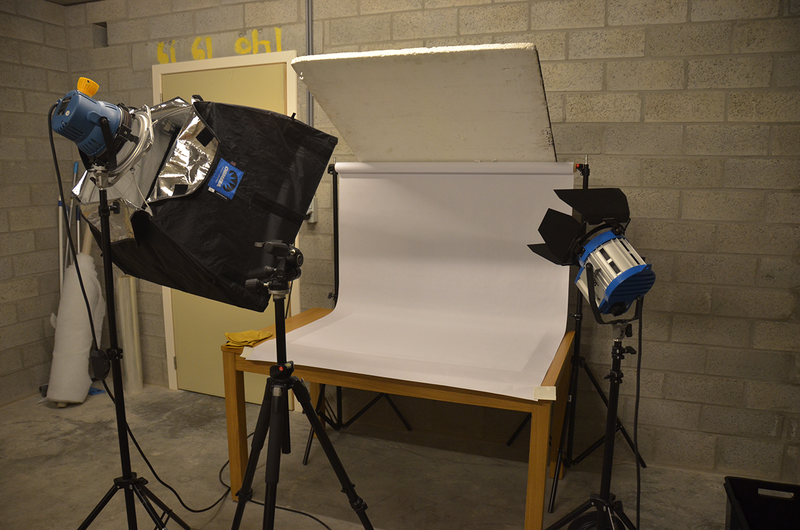 You can see on the pictures above how I have set up my mini studio in my basement. 2. Don't use fluorescent light as they flicker at a certain frequency. Tungsten or LED is your best option. If you do so anyway then the next tip might be a help to cancel out some of the flicker. 3. Use a slow shutter speed on your camera. If you use 1/200th of a second for example you might have a bigger chance at getting flicker. Especially when using fluorescent lights. They have a much lower frequency and you just might take the picture right in between the two light pulses and therefor have less light than the previous frame. 1/5th of a second works for me. 4. Use an open diaphragm if possible. The aperture gives you control over your exposure but also the depth of field so experiment what works for you. I still had enough sharpness at F5.6 on my Nikon D7000 which has an APS-C sensor. Most modern DSLR lenses have their diaphragm controlled by the camera. The camera will open up the diaphragm completely in its default state. When taking a picture it will change the aperture of the diaphragm to the setting which you have set. This means that the diaphragm changes state. Your camera might have difficulties at going back at the exact same state as the frame before. Even the smallest difference in aperture between two frames will give you a difference in lighting. If you leave it open then the change of state is not as big as when you close it almost completely and less error will occur. Also a small difference in aperture on an open diaphragm between shots has a smaller margin of error then on an almost closed diaphragm. If you use old school manual lenses then this problem is non existent as there is no change of state when taking the picture. If there is too much light coming in the camera due to a large aperture you can use a ND filter to decrease the light going in. 5. Wear dark or even black clothing while shooting. White clothing might reflect indirect light into the room and therefor will change your lighting condition when you are moving around. You could try to stand in the exact same position while taking the picture but that is usually very unpractical. Black clothing doesn't reflect light and will have no impact on your lighting condition. 6. Don't use the automatic white balance function. Yes it it easy when shooting pictures but for stop motion it is another potential source for flicker. Instead fix the value depending on which light you use. Tungsten might need a different value than LED. Test it and then keep it the same for the whole shoot. When shooting stop motion you have to keep in mind which frame rate you want to use while shooting. There are a couple of options. 24 frames per second: This is the ideal world. It looks nice and is as much as regular feature film. The drawback is that you need to take 24 positions for every second of video you want to make. This can be time consuming. 24/2 frames per second: This means you take only 12 positions per second but use every frame twice. This is usually more achievable and gives decent results. 30/2 frames per second: Here you take 15 positions per second and use every frame twice. This is closer to the American NTSC standard and a bit in between the two above concerning the time spend to record it. Most of the time you will be doing locked off shots (Shots which have no movement in them). For stop motion you need a good sturdy tripod that will keep your camera in the same spot. But even then you can have slightly moved shots and they can be quite distracting. This is usually caused by pressing the button on you camera. By entering a bit of force on the camera you can move it ever so slightly. The solution is to use a remote. I use a wired one but wireless remotes are even better as you don't have to touch the camera anymore. Make sure not to bump into the tripod. It will move a tiny bit and that is very visible once you convert your project to video. I had it happen to me once and I had to start all over again. Luckily I was only a hundred frames in or so. What if you want a pan or a travel in your shot. Although you could do it manually it might be better to use a motion controlled slider. I have no hands on experience on this but systems like Edelkrone's Sliderplus with action and target module can generate great repeatable results. Making stop motion video's can be fun but attention to some details is important to create good results. I have made two video's so far and it took me about an evening a video to shoot it.